Surprised? You shouldn’t be. John Goodlad found the same thing 30 years ago in A Place Called School, and our surveys have had PE at #1 every year. Nor should it be a surprise that Science and the Arts are ranked highly. (We will of course want to understand better why this is so). 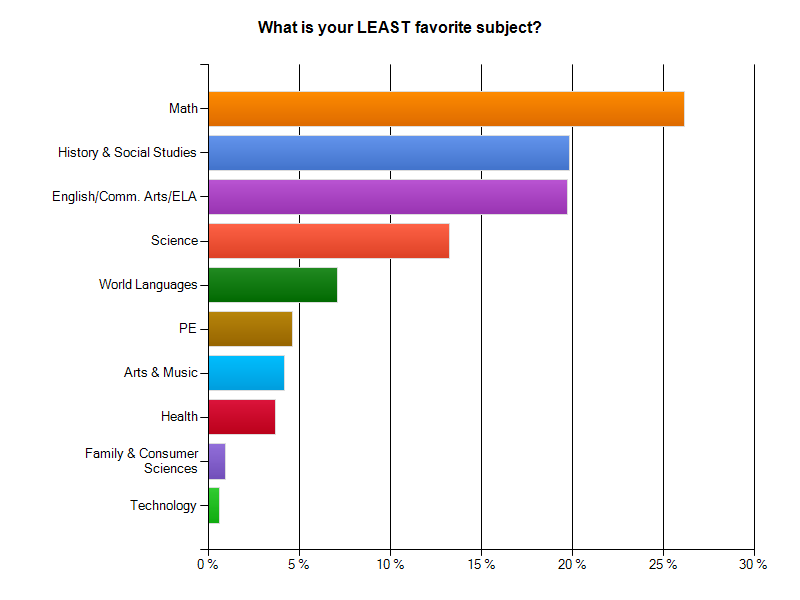 What, then, are the least favorite subjects? No surprise there if you consider most kids’ experiences and comments. 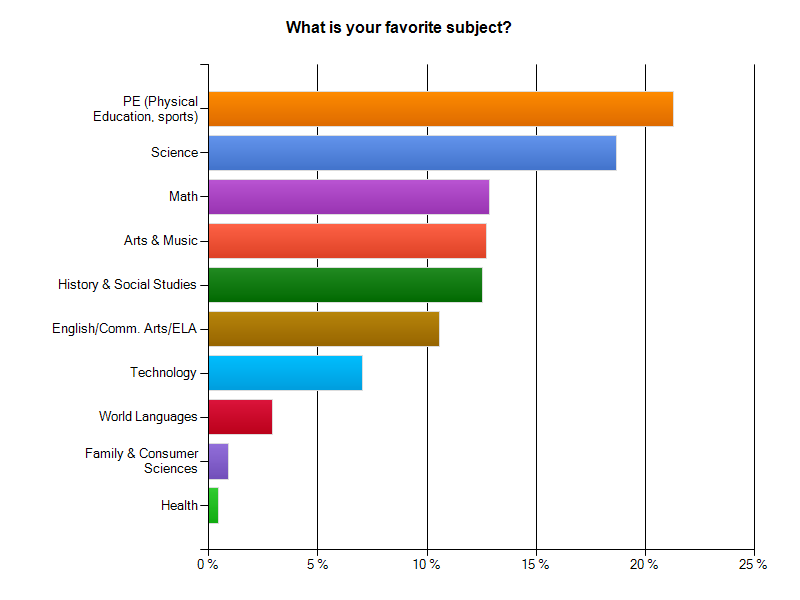 What is of course noteworthy is that math was also the 3rd favorite – and this is a consistent finding in our survey. It’s very bi-modal: you either love math or you hate it, and more people hate it that love it. (More on the reasons in the follow-up post). 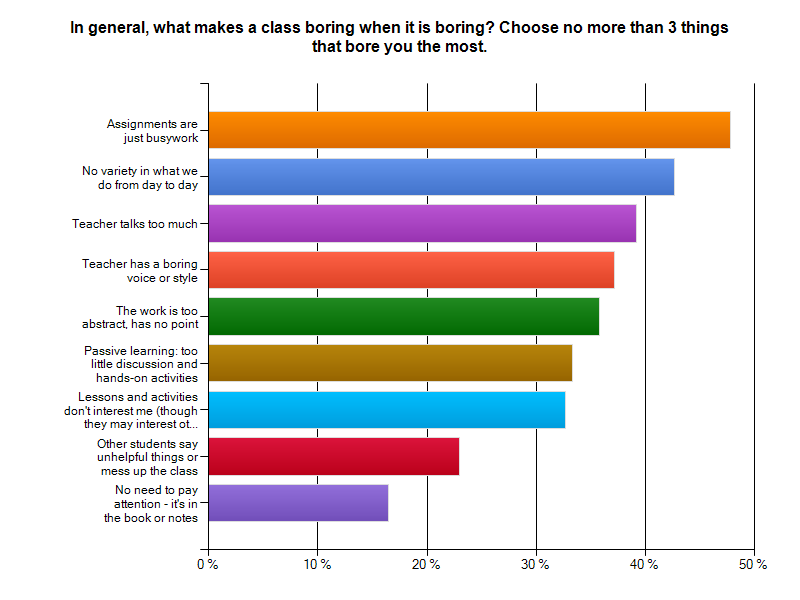 2/3 of students really dislike HS math. No other subject has that strong a profile of dislike. The Science response is interesting in light of the fact that it is one of the more highly liked subjects: engagement and rigor are not opposites. The ELA/English response is, of course, worrisome. (More in the follow-up post). Worrisome – but not surprising, if you have followed my survey results and the national High School Study of Student Engagement. Of note in urban schools: the % of students who say “Other students say unhelpful things or mess up class” goes up to the 40% range. Finally, what about their teachers’ approaches and attitudes? Look closely at the number of responses that get a majority of non-agreement answers (i.e. the total of Disagree and Strongly Disagree): teachers do not make the work interesting, give good feedback, play to talents and interests, differentiate. Most worrisome, only half of students say that teachers know them – a key indicator in Gallup’s study of student success. By the way, this school’s profile is NOT representative of the best schools in our survey. In the best schools, there are no questions that get a majority of non-agreement on this list, and most are in the 70% agreement range. Very telling are the constructed response answers, as you’ll see next time. Students were asked to explain why they liked and disliked subjects, what was the most interesting work they have done this year, and if they could tell their teachers 1 thing to make school better, what would it be? In my follow-up post we’ll look at those responses in light of these graphs because they shed important light on the meaning of the numbers. That said, you can probably already answer the question: if this is a ‘typical’ high school – and it is – what is the problem statement? I would like to give the survey to students at my school. Would love to give this survey to my 8th graders in Montgomery Township! OK! I’ll set you up a link and email it shortly. Thank you for an insightful post. As someone who has spent the better part of a quarter century in public education, I sometimes want to run my head through a wall–simply because what I have been screaming about without any real effect for my entire career has come true. The more we regiment, the more we want to paint with a broad brush what “good teaching” looks like, the more ineffective we become. The more we do these things, the more unhappy our teaching staffs and students become. I am an administrator now, and I feel for our teaching staffs and our kids. No other profession is as scrutinized as ours, and no one does more with less than we do. Yes, we absolutely are teaching a different child than what I was 35 years ago in high school. Attention spans are definitely shorter. We have more access to amazing information via the internet and other technology based platforms. Yes, it makes sense that some kids (maybe a majority) are not ‘sit and get’ learners. However, we have instead of listening to our own advice gone to more and more high stakes testing, which makes people much more anxious and makes classes less fun for teachers and students. Teachers are afraid to wander very far from proscribed curricula as they fear they will meet with reprisal. I fear that the root of all of this can be traced back to the William Bennett strategies of the early 80’s, and has been taken and run with by “foundations” like the Walton, Koch Brothers, Zuckerberg, Gates, and Rex Sinquefield ones, masquerading as education reform proponents–we see them making alliances with urban reformers, and what they preach is accountability. They hire consultants at exorbitant rates, fire everyone in the system and bring in their own people, push for charter schools and siphon money and good students away from the public schools, and then wonder why there still is no success. I can only posit that the final goal here is to tear down what was once the leading light of free education in the world to the point that a “private alternative” is the only acceptable choice for us. If that happens our country is in more trouble than I can imagine. I completely agree with the earlier poster who said these things: we have to address in no particular order funding for education, salaries of public school teachers, our culture of accountability (usually there is some reward and not just a stick tied to accountability), educational freedom, and poverty as an anchor on our success. So many want to say all students should succeed despite poverty, and I agree; however, how can they succeed if we are not given the resources to combat hunger and lack of basic skills? It is easier to attack education than it is to actually address societal needs. The same people stating that we need to do a better job educating our students of poverty are the ones who will not give more financial aid, education assistance and parenting information to those children’s parents. I would add, finally that we need to connect kids to their futures. If we are able to show students, not tell them but SHOW them, what they can do with the skills they are learning in math, science, social studies and Comm Arts, they will stand a better chance of taking those subjects seriously. I appreciate this information, and look forward to further posts. Think about your own school. What do you see as similar? I nodded in agreement at each point. And so, when will we focus on gathering as learning communities to provide interest-driven, actively engaged classrooms in each of our schools? It seems that’s where time and funds need to be provided. What do you think? If PE is the most liked class of all and if PE is the class that requires the least amount of thinking, could it be that students resist having to think? Could it be they lack the mental discipline, mental stamina and mental fortitude that some classes require? Perhaps some students misunderstand the challenge of training the mind as well as the body, which are two very different things. I don’t think the data suggest that this is true. 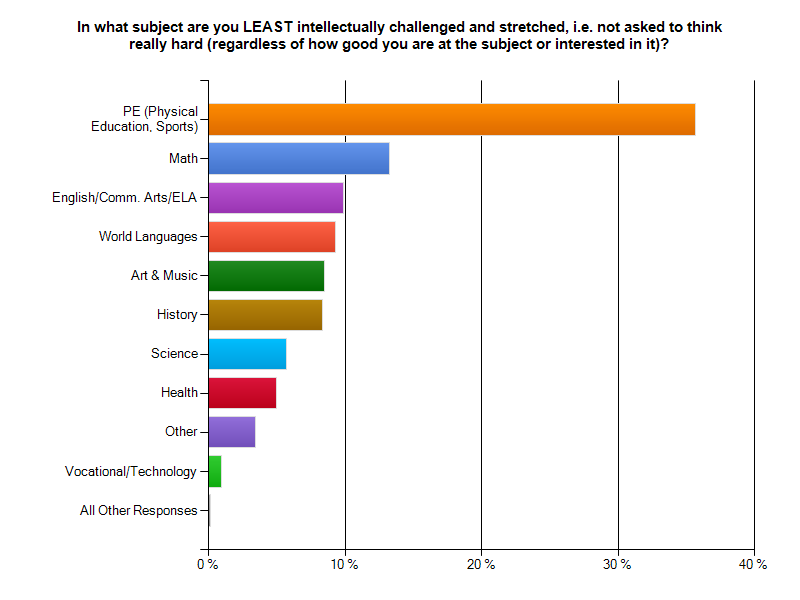 Science is both liked and viewed as very challenging, and girls put PE much lower. (Boys rank it so highly that it becomes the ‘winner’). 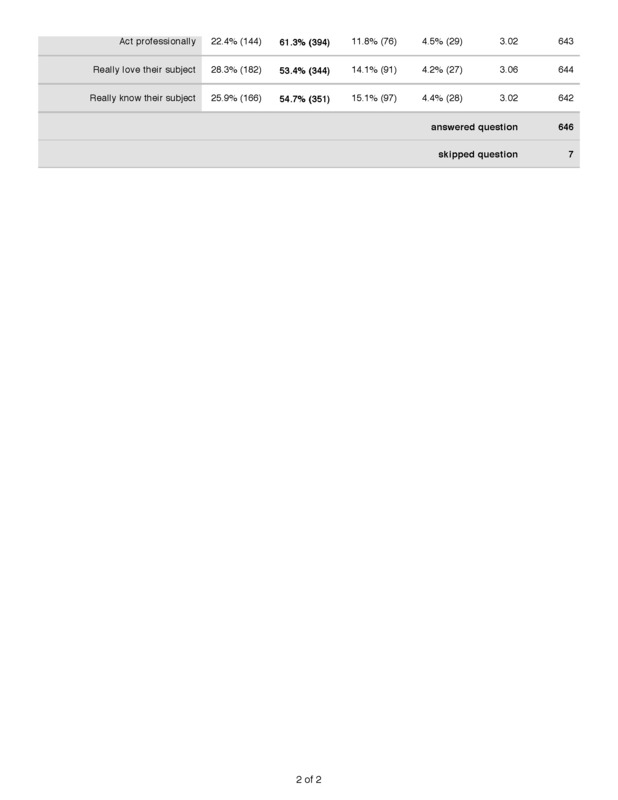 I think the results I just posted from the A students are far more indicative of the problems at hand. 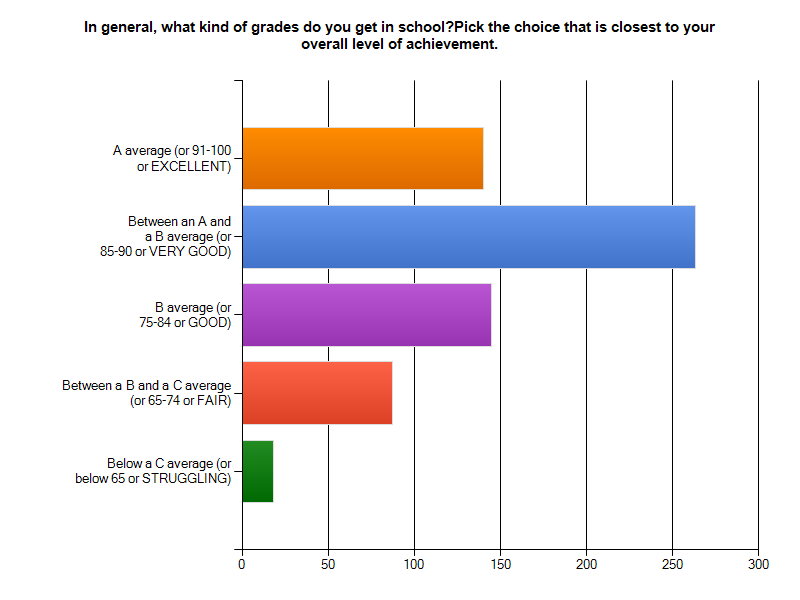 Why do you think that “A” students would be better reporters of the challenges in school than those with lower grades? To me you cannot tell by grade how good at reporting they are. Sometimes “A” students have unrealistic expectations about themselves and their teachers. Sometimes “B” and “C” students have struggled to ‘make the grade’ due to some of the problems listed. All are indicative. And, while we want to make sure those making “A” grades are learning what they need to know (and not just good test takers or other such reason), we mainly want to make it so struggling students and drop-outs turn themselves around. I don’t think they are necessarily better reporters of their overall experience. I would in fact expect the misfits tone better barometers. 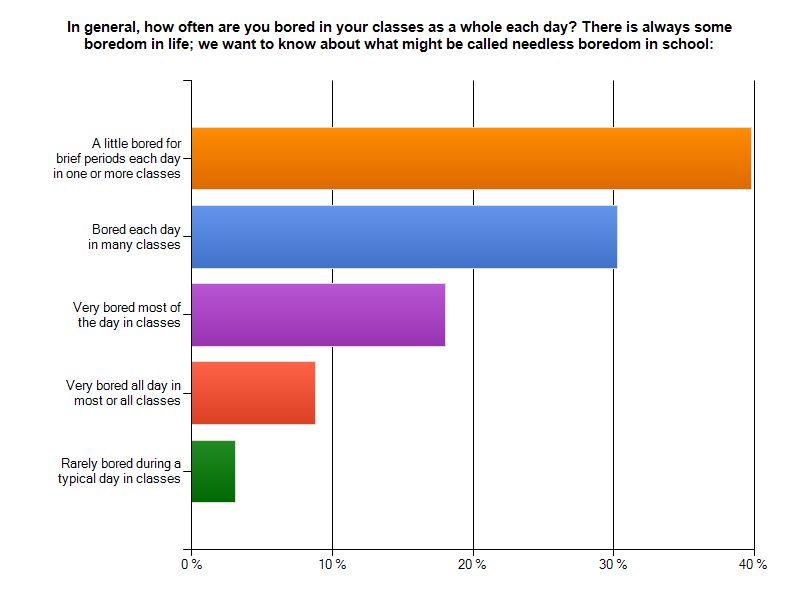 My point was that if even our A students are bored/disaffected, then we cannot ignore the problem. Purely anecdotal, but my son was miserable as a freshman at our suburban NJ town’s big HS. We pulled him out and put him a county vo-tech, in a multi-media arts and design shop. Although it’s not perfect, and the academic classes are still somewhat painful for him to endure, he at least spends 3 periods a day doing something he really loves. I can only assume that there are more kids like him out there who might benefit from a setting like that. Really interesting post, Grant. Thank you. It’s disheartening to me that the most preferred course (P.E.) is also the least intellectually challenging. 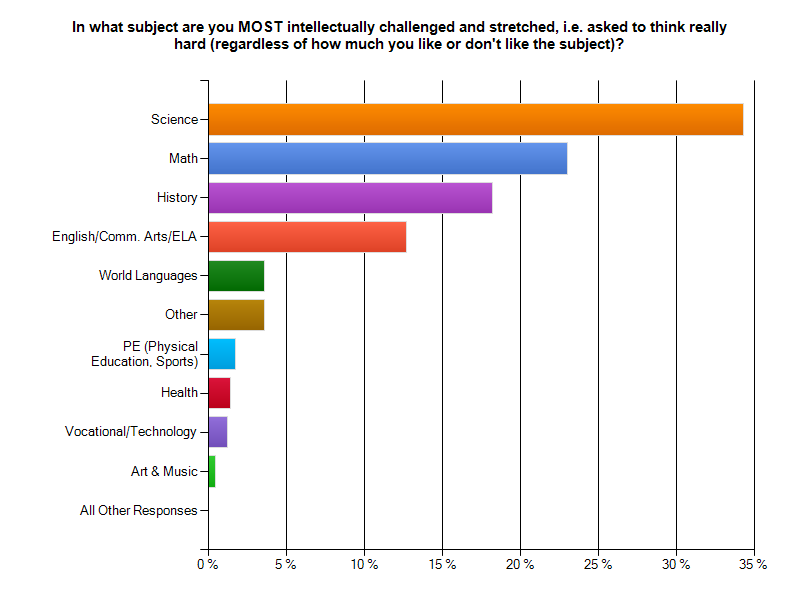 We can’t draw any real conclusions from that, but it does make me wonder if students prefer things that are “easy.” What separates kids who like intellectual challenge from those who do not? Presumably some combination of skills and motivation. But by the time kids are in high school it’s kind of late to try to intervene on this. It would be interesting, if we had a crystal ball, to look back at the elementary and middle school experiences of these kids and see if we could identify the meaningful differences. No, easy cannot be the demand. Science is number 2 and is viewed as highly challenging. Nor do most kids say it is easy to get good grades. I think it has a more basic meaning. Activity is better than sitting. 1. Is this “collegial exchange” between you an Petrilli online anywhere? 2. I know you’ve written somewhat extensively about disagreements between you and Hirsch regarding knowledge and understanding. I still have a hard time discerning what it is, exactly, that places your two perspectives at odds. I recently read Writing for Understanding from the Vermont writing Collaborative. In their text–and in your forward–knowledge about a topic is a prerequisite for strong writing. We can’t write (well) about what we don’t know. Without deliberate attention on the part of the teacher to developing knowledge, even skilled student writers will write lousy compositions. It was hard not to think of Hirsch when reading that book. I recently attended a reading conference and watched a video of a TC teacher leading a conversation with elementary students. The kids read a leveled book about bugs. Most kids had no specific knowledge about bugs, and the book did not seem to be part of any substantive unit about insects. They were asked to employ content-neutral strategies to the text–e.g. ask a question, make a connection, etc. The conversation meandered without any clear point. Imploring kids to “return to the text” to “support” their claims did not improve their understanding; “accountable talk” sentence stems did not lead to intelligible talk. One imagines that in the next session kids might be asked to apply those same strategies to a different text–perhaps one about the life cycle of frogs. To return to Petrilli’s claim: is it really so “off base” to see some connection between this kind of instruction and weak NAEP results? Not the sole contributing factor, but one of many factors? His proposal had little to do with high school; that was my complaint. I’m with you on content less teaching. But we’re talking high school in which content is always being taught. So if it isn’t being learned then lack of content is not the problem. Nor is it what these data say here. This is highly complex. We’ve had so many solutions over the years that were rolled out and ended up not being helpful. We are now on a high stakes/accountability “roll”. There are many motivating things we can do. 1. We need to start treating high schoolers with more respect. Our high schools have become very institutional with guards, gates, stifling routine day. If they were wearing prison attire and were single gender- you might think it is actually a prison. Students have little control over their high school experience. To get “buy in” and thus increasing motivation, we must give students more control over their education. That means open campuses. That means more than 25 minutes for lunch. That means getting to select from a better assortment of courses. That means having an option to do a technical degree. 2. We have a huge drug/alcohol problem in our schools. It kills motivation. Criminalizing it has not helped. If we could have programs that work to prevent and to help kids who get mixed up in this earlier on – that would be huge. Proper affordable treatment access is vital. 3. We have a lot of kids who live in poverty. It’s very difficult to get motivated to do your math lesson when you have nothing in your stomach, didn’t sleep the night before, and have to watch your brothers and sisters each day. We must find solutions to poverty. This is huge. 4. We need to improve our colleges of education. I know some programs are excellent. Some are not. I recall seeing one class featured (can’t recall why). The class was teaching teachers how to make certain simple crafts that kids would do in kindergarten. I’m sure they likely tied it in to how to teach a certain lesson- but this was the course for the semester- not just one day. Really? This makes up a 3 credit course?And any teacher who teaches middle school and high school should have a masters degree in the course they want to teach. So, biology teachers should be required to have a masters degree in biology. No more gym coaches teaching biology unless they happen to have masters degrees in bio too. 5. Courses ought to be more like college. There should be a mandatory syllabus. Many teachers give a syllabus but it contains: class rules, grade breakdown (90 -100 is an A), general statement of what the course is about, teacher contact info. This is not what I mean. I have never seen a teacher in high school give a list of the assignments on the date due, the topic of the day on each day, tests listed on those days, etc. Kids do not know what to predict in a course- again, that control! My son currently is in a challenging course schedule. I have suggested to him that he read ahead and try to work the math assignments ahead. He said he cannot because there is not a way (besides bugging the teacher) to get the assignments ahead. I told him to just do the next chapter in the textbook. He said they don’t go chapter by chapter. He does not know from week to week what they will be working on. This is just ridiculous and easily solved. It puts kids in control of their work. 6. Give kids back their classwork once it is graded! This seems like a simple thing. However, it doesn’t happen anymore. Teachers must keep “portfolios” now for each student. They also have to keep it as they use the same tests (I guess that’s the case- not sure). Kids need feedback though- and they need to be able to take it home, think about what they did on the test, study it for the next test and the final. And- it’s their work. They need to be able to own it. 7. Stop the high stakes insanity. We have a middle school principal here in my district (at Okeeheelee Middle School if you want to google it)- he gave a press conference a week ago letting them know that 1/2 the school year is dedicated to testing. Not all kids are tested 1/2 the year. But all kids are impacted. Work stops when any 1 kid in a class has to take one of these tests. The teachers cannot start anything new. It’s insane. It kills motivation. And it kills the chance for kids to dwell in the learning pool of the subject long enough to learn it. Schools should be places to learn. Right now, they are places to corral children to hold them hostage for four years of jumping through hoops- ones picked by adults who may not even be well educated (our fine legislature). My husband calls it “babysitting”. I’m hard pressed to argue that point. Nothing will change until these 7 points are addressed I’m afraid. Thank you for starting this great discussion. As a former K-12 Department Supervisor for 10 years, after having taught science and math for 12+ (I am now a MS Principal) I once asked a group (25) of teachers to list their top 5 professional development venues / paradigms / modes. etc. Observation didn’t make the top 10. Not surprising I suppose, and yes, I was one of the people observing them (ouch). What was more surprising though was that none mentioned regular colleague observation. We began a colleague observation program not long after and my impetus for doing it was my early insecurity with my own teaching. I had no education pre-service experience and no formative undergrad or graduate level education courses (Bio major). What formed my repertoire was aggressively observing a group of 12 science teachers while I was a substitute teacher for the first 8 months of my teaching career. Lesson study has been proven (Japan and National Board Cert) to have immediate and lasting impact on teaching. If one wants to “reform” (as in “re”= do over, “form” = take on a different shape and structure) provide every public school with 2 permanent substitutes teachers and require every teacher to spend 3 full days per year observing colleagues. Sounds easy and too open-ended without additional direction given to the observers, but in my experience the latter evolves itself. No, it may not help the weakest teachers and that is where trained and competent leadership must steward what is best for students, but for those who will close their door and step onto an island for 25 to 30 years of their professional lives and who may not ever have lasting exposure to transformational practice it will re-form teaching. Great proposal. Close observation is essential in every profession. Learning walks with a specific observational focus are fabulous p d sessions. The data here supports one hypothesis I’ve had for awhile based on 10+ years of working with high schools in a PD/Consultative capacity. Although many high school teachers in general are thought of as content experts, in the subjects of ELA, History/SS, and Mathematics (those reported as low interest by students), teachers are perhaps less likely to be or have been true practitioners of their disciplines. They may have done well in the subject in school and liked it well enough to major or minor in it, but having a deep, conceptual understanding of the discipline (including how it’s organizing, what the important principles are, what’s intriguing and transcendent about it beyond the walls of school) is not a given. Knowing “what I teach” and knowing the discipline are not synonymous. For example, while many English teachers read novels for pleasure or for teaching, fewer engage in writing for different purposes/audiences, public speaking, etc. Many history teachers know “the facts” of history and have special areas of interest (e.g., Thomas Jefferson, WWII Battles), but few that I’ve encountered were trained as historians or social scientists or have a sense of how to approach (or lead students through) history as inquiry. The same is true in my experience with math teachers–“good” math students themselves, but see themselves as a math teacher versus as a mathematician. By contrast, my guess is that science teachers were either trained as scientists or worked as scientists. For those who weren’t, inquiry (or some version thereof, or at least something hands-on/minds-on) is widely seen as a staple of the HS science classroom–so at least students are up and doing something that feels better than sitting and listening. It’s special subject teachers who are most often and most obviously practitioners of what they do. Art teachers are and view themselves as artists. P.E. teachers are and view themselves as athletes and coaches. It’s not enough to have a degree or endorsements in the subject one is teaching. Living it, loving it, and understanding the true nature of the discipline or art is foundational to true content knowledge. This doesn’t translate directly into being a great designer or curriculum, assessment, or instruction, but it’s a good start! I believe there is some truth to your theory. It becomes even clearer when I visit middle schools and see that, by and large, few teachers really have experience outside of a textbook. And it also explains why math teaching is so desultory: very few teachers ever had to solve non-routine ‘messy’ problems: they likely think of math, itself, as exercises in plugging and chugging. It is certainly extremely rare for math teachers to deviate significantly from a textbook. (cf. my posts last year on Exeter’s problem-based math courses – a noteworthy confirmation of your thesis since their faculty is filled with teachers with advanced degrees in math. That said, the problem can only persist for decades because we have been unwilling to tackle it more aggressively. I think admins. and – especially – Dept Heads have been delinquent in assertively pushing for internal reforms. Anyone can learn more about their subject; anyone can learn new practices that are pedagogically more engaging and effective. It’s not rocket science. I plan to propose a few policies and practices in the final post that hold some promise in breaking the combined teacher isolation and inertia. We have decided unilaterally that high school students need a certain amount of science, certain amount of social studies, etc. And in many cases the specific content in those subject areas. What we refuse to acknowledge are many high school students do not have interest in those subjects, for a variety of reasons. The first bar chart you show is very close to the root cause of students being disengaged. A great teacher can engage a kid who “hates” the subject, an average teacher cannot. Thus the problem statement: High schools have offered coursework that is of no interest to its customers; the students. How do high schools integrate core content into courses that will engage students–career technical education is one proven example of it being done. This same practice occurs in colleges as students are forced to take liberal arts courses, often in their Frosh year, they disengage, do poorly and drop out. So should HS’s look at its practice of expecting all kids to take all subjects? The article in today’s NY Times, about how Europe “tracks” kids sooner, only means they do it more formally sooner. U.S. HS’ do it as well, its just embedded in our culture via honors classes, AP classes, etc. Still, at the end of the day if each HS classroom has a great classroom teacher, not just well versed in the content, but knows how to design a coherent unit of study, then more students will be engaged and decide to do well. Not surprising as in my experiences, high school teachers are most resistant to change, reflection on their practice, and may not be willing to do whatever it takes to have kids succeed. Of course there have been some outstanding HS teacher examples who do not fit that mold. Unfortunately, the model teachers are bullied by those who are afraid to leave their comfort zone. Additionally, there is always the “I’m preparing you for college” mantra. There may be some truth to that as higher ed is not likely to embrace the same goals of engagement and success for all. However, I am convinced that kids leaving HS with deep understanding of the content will be successful in college…understanding as opposed to being compliant or worrying about GPA. They need to be engaged in learning in all subject areas. What make PE so engaging? Feedback, activity, coaching, encouragement, working toward competences, etc. We can learn from out physically fit friends! Excellent line! Mine has always been a tad different: why are we preparing them for the worst of college instead of the best of college? Well said! And nicer than the one I repeat–gives credit where credit is due. The problem statement lies in the fact that a majority of our high schools struggle (or fail) to meet students where they are at in their formation. It’s not necessarily the “what” (i.e., bar graphs of subject interest) but the “how” (i.e., recognizing the agency required of the teachers in question). Rather than examining the symptoms, we continually rush to prescribing. Sizer’s work with CES showed how we are quite efficient at turning a blind eye toward where most adolescents are in their perceptions and experience with the American educational system.